You’ve got the professional quality Waxaway products; now get some extra hints and tipsfrom the salon professionals at Waxaway. What is waxing & how does it work? Waxing is a popular depilatory method where hair is removed from the roots for longer lasting results. Wax is applied to the skin and clings to the hairs. When wax is removed, the hairs are stuck to the wax, leaving your skin smooth. Hair regrowth becomes softer and results last longer than other forms of hair removal. How long does waxing keep my skin hair free? Waxing can keep your skin hair free for up to 3-5 weeks; however results can vary with each person due to different hair types and how frequently you wax. What is the difference between Hard Wax and Strip Wax? Hard Wax (Salon Wax or Salon Wax Sensitive) is a peel off wax applied thickly on the skin and removed with your fingertips. It is used for waxing sensitive & delicate areas such as eyebrows, upper lip, facial waxing, underarms, bikini line & Brazilian waxing. Strip Wax (Warm Wax or Aquawax Roll on Kit) is applied thinly and removed with a waxing strip; this is great for larger areas of skin such as the legs, arms, back, chest and some facial waxing. How do I prepare my skin before waxing? Always test a small part of the area to be waxed 24hrs before to ensure no skin irritation occurs. Hair growth needs to be at least 2mm from the skins surface so the wax can adhere to the hair. Longer hair should be trimmed to 5mm before waxing. Area to be treated must be clean, dry and free from any oils and creams. If your wax isn’t picking up all the hairs it may be because there are too many dead skin cells that the wax is sticking to rather than the hair. Exfoliating the skin daily will remove theses dead skin cells and let the wax adhere to the hair properly. Should I shower before I wax? No, always avoid waxing immediately after a shower or hot bath. The warm water will open your pores but it will also soften your skin making it more likely to bruise or become irritated when waxed. Wait an hour or two before commencing your waxing treatment. How do I know my wax is the right working temperature? Wax is at an ideal consistency and temperature when it resembles honey and glides easily over your skin. After heating your wax, test it on the inside of your wrist before use. The wax should not be uncomfortably hot on your skin. If it feels too hot, leave it cool for a couple of minutes and test again on your wrist. If wax is not spreading easily and has a stringy texture, it is too cool and will need a bit more heating time. The amount of discomfort experienced when waxing depends on the individual. Waxing offers an affordable way to keep skin smooth for longer periods than shaving so you don’t have to wax as often. A tingling sensation can be felt immediately after waxing, this is the tiny nerve endings in your hair follicles reacting to the removal of the hair, and this will pass in seconds. After regular waxing the discomfort lessens because the hair follicle becomes weaker. However if you are new to waxing you may experience more discomfort but as they say, no pain, no gain! Follow these helpful tips to lessen the discomfort. Waxing with a friend will help distract you from the discomfort & they can assist you with your waxing technique. How do I remove Strip Wax? Use a Waxaway Wax Strip, available in a 24pk or included in Waxaway Waxing Essentials Pack. Simply smooth the strip over the wax you have applied in the direction of hair growth. Press firmly to ensure the wax has adhered to all the hairs. Hold skin taut with your other hand to avoid bruising. Remove your wax strip quickly in the opposite direction to hair growth and as close to the skin as possible. The wax breaks off in pieces when I try to remove it, why did this happen? This will happen when the wax cools down too much on your skin. For peel off waxes, such as Waxaway Salon Wax, it’s best to wait until the wax it touch dry, this will only take 15-20 seconds. The wax must still be flexible like plasticine when you remove it. Why doesn’t my wax wash off with water? Waxes are made from resins, which are an oil based product. This means you need an After Waxing Oil to dissolve the wax if you want to remove it from your skin. Alternatively you can use any gentle oil based product (such as olive oil or vegetable oil) to remove wax residue. Waxaway Warm Wax and Aquawax Roll on Kit are the only Waxaway products that are water/sugar based, which allows themto be washed off with water. No hair is being removed, what is going wrong? If you have not exfoliated the skin the day prior the first few attempts will really only be removing all the dead skin rather than grabbing the hair. Ensure your skin is clean and free from sweat, oils and moisturisers so the wax can adhere to the hairs. Your hairs might also be too short for the wax to grab, try waiting a few days to let your hairs grow a bit longer. I have experienced bruising/ swelling/ irritation when using the wax, what went wrong? Waxaway do all they can to formulate waxes to the highest quality which minimises the chance of bruising, swelling, redness and irritation to your skin, however incorrect waxing technique can still cause these types of reactions, no matter what kind of wax you use. Make sure you read through the instruction booklet included with your wax before you use it. It is also advised to do a patch test of the wax 24 hours on the palm of your hand before you commence waxing to make sure your skin doesn’t have an adverse reaction to the wax. For waxing beginners, your legs are the best place to start practising your technique and build your confidence. For advice on waxing techniques, visit the Waxing 101 page and if you still have questions please contact our trained Waxaway beauty therapists are here for salon tips and further advice. How do I care for my skin after waxing? Wax residue can be removed by applying Waxaway After Waxing Oil or After Care Lotion. Keep your skin moisturised between waxing to avoid in grown hairs. Avoid using antiperspirants if underarms have been waxed for 24hrs and avoid sunbathing directly after waxing treatments. Have a look at the Waxing 101 page for salon after care advice. 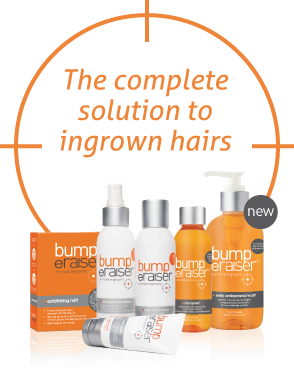 If you suffer from ingrown hairs, treat problem ingrown hairs with Bump eRaiser Ingrown Hair Treatment range. Visit www.bumperaiser.com.au for more information. What do I do if I accidentally get the wax in a place where I do not want to remove hair? Use Waxaway After Waxing Oil or a gentle oil based product, such as Olive Oil, Vegetable Oil or Baby Oil to dissolve the wax from your skin. If you are using Waxaway Warm Wax or Aquawax Roll on Kit, dissolve wax with water. What do I do if wax gets on my furniture, clothing or carpet? Press a waxing strip over the spill and try to lift off as much wax as you can while it’s still warm. If wax has become cool, use a hairdryer to heat it up again and repeat with the wax strip. Use a gentle oil based product (baby oil or vegetable oil) to dissolve remaining wax residue, then use a fabric / carpet cleaner to remove the oil stain. Let wax dry into a solid mass and peel off as much as you can. Use a metal spatula or butter knife to scrape off as much as possible. Clean up any small bits of wax that you have peeled off & preheat an iron to lowest setting with no steam. Place a wax strip, cloth, strong paper towel or plain paper bag over the wax spill and gently press the tip of the warm iron over the wax area until it melts and adheres to the cloth. Make sure you keep the iron moving in circular motions to avoid scorching the fabric. When the wax has been melted, lift the cloth from the carpet or clothing. Repeat as necessary, with a clean cloth each time, until no wax remains. If your spill is on a bench top or other hard surface, use a citrus cleaner or vegetable oil to dissolve the wax and clean off with a damp cloth. A larger spill will require a certain amount of ‘elbow grease’. Simply dissolve the spill in warm water. My Salon Pro Wax Heater doesn't appear to be working, help! The Waxaway Salon Pro Wax Heater is designed to keep your Salon Pro Hard Wax or Salon Pro Strip Wax at an ideal waxing temperature. Follow these steps and you might find that your heater is working as it should. Place the wax tub in the microwave for 1-2 minutes until it resembles the consistency of honey. Remove wax tub from the microwave and place it directly into the insert of the Waxaway Salon Pro Wax Heater. Turn your Salon Pro Wax Heater on. The red indicator light will be on when the heater is heating to the ideal temperature. It will switch off when this temperature is reached. When temperature becomes too cool, the red indicator light will turn on again and keep the wax heated appropriately. You can use the wax immediately as the microwave will have heated the wax to working temperature. The Salon Pro Wax Heater will maintain the temperature so you do not have to worry about your wax cooling down. Turn the unit off when your waxing treatment is complete. If Salon Pro Hard Wax or Strip Wax is placed in the Salon Pro Wax Heater insert when wax is cold, it will take approximately 1-2 hours to melt the wax completely. You can use heated wax from the edge of the jar after about 20-30 minutes, as this area will heat up the quickest. However for the fastest heating time, use the microwave method. If the red indicator light on your heater isn’t turning on or the element doesn’t appear to heat as it should FREECALL 1800 245 412 and speak to a Waxaway customer service officer to determine if your heater is faulty. Heaters come with a 12 month warranty. If a genuine fault is found, please return your heater to the place of purchase with your receipt and you will be able to exchange it for another one. Do waxes have an expiry date? No, wax does not contain any ingredients that will ‘go off’ however, it’s best to use your wax within 12 months of opening. What makes Waxaway waxes salon quality? It’s all in the ingredients and the manufacturing methods. Hair removal waxes are made from resins, however the type of resins used and how they are processed make a huge difference to the quality of the wax. Waxaway waxes can reduce the chance of ingrown hairs and skin irritations due to the superior quality of ingredients. Waxaway is manufactured by Caronlab Australia, the #1 professional wax manufacturers in Australia, New Zealand & the South Pacific region. More Australian professional beauty therapists use Caronlab waxes than any other brand because they can trust Caronlab waxes are made with the highest quality salon ingredients. Waxaway waxes are these same professional wax formulas so you can experience the salon difference at home. Many Waxaway waxes are made from Polycyclopentadiene resin, which is the highest quality salon professional resin available. This mineral based resin is more reliable than natural resins because it is synthesized to exacting standards, therefore remaining consistent in quality. As there are no unforeseen variables in the raw ingredients, Polycyclopentadiene makes hypoallergenic waxes that are gentle on sensitive skin and delicate areas of the face and body. Derived from the sap of trees, this naturally occurring salon professional resin is modified, filtered and purified to make it suitable for all skin types. Natural resins can vary in quality due to the sap of the trees varying in quality; however Colophonium is the most refined and highest quality available and is used as the base ingredient for Waxaway Salon Wax. A resin to avoid is Untreated Gum Rosin, a cheaper alternative natural resin which is also used in fireworks, furniture polish, glues and adhesives & pine oil cleaner. Cheaper resins are not as refined; therefore produce lower and inconsistent quality waxes. Lower quality resins are known to cause skin hypersensitivity, respiratory problems, redness, itching & dermatitis. So best check the ingredient listing before purchasing your wax! You can rest assured that Waxaway do not use Untreated Gum Rosin in their products. Some waxes aren’t made with resins, they are made with sugar and water as their main ingredients. Waxaway Warm Wax and Aquawax Roll on Kit are water-soluble due to them being a sugar-based wax.